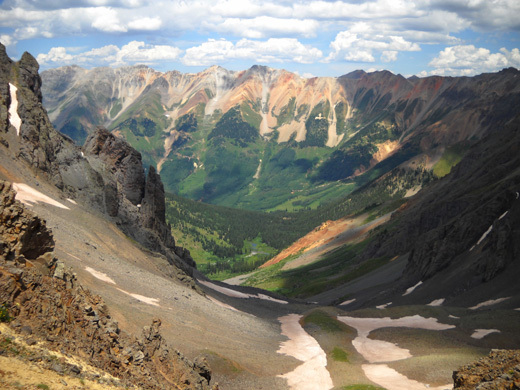 dirt trails, and cross country in Southern Colorado's San Juan Range, USA." This is the 17th running of the Hardrock Hundred, Jim's and my choice for America's Most Beautiful Trail Run. 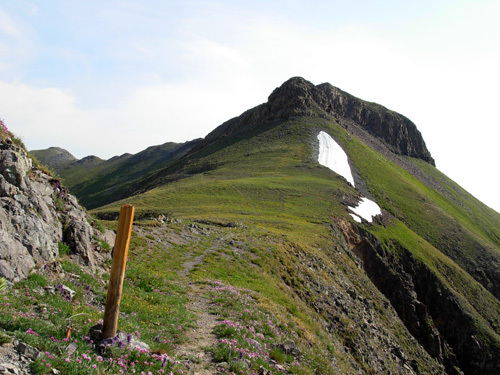 The race has been held since 1992, with two cancellations due to extreme environmental conditions: in 1995 because of excessive snow in the San Juan Mountains and in 2002 due to nearby forest fires. I took this photo after we got done with communications duties at Grouse Gulch. This year runners reach that literal high point after running and walking for approximately 64 miles. There are varying amounts of snow at the higher elevations from year to year, with glissading and post-holing often in the mix. Runners are also required to ford dangerous streams, climb some rocks using their hands, cross steep cliffs with vertical drops of several hundred feet, ascend or descend snowy slopes with or (usually) without a fixed rope, and try to avoid encounters with elk, bears, mountain lions, and other wild moms protecting their young. several places where a slip could result in a fall of several hundred feet. I took this photo in 2007. 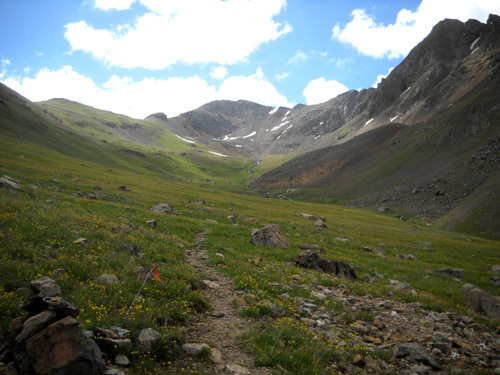 In addition, race philosophy dictates that runners be largely self-supporting for hours at a time and be capable of route-finding day and night after the already-minimal course markers have been sabotaged by wildlife (elk are particularly fond of the flagging), storms, melting snow, or human miscreants. As the runners' manual emphasizes, this is a graduate-level foot race. It's obvious that I'll never, ever be able to run this race. I started running 100-milers too late in life, when I had already lost most of the speed I once had, and now my bad knees totally prevent even qualifying for Hardrock. Jim still has some desire to do it, however, if he can finish a qualifying mountainous 100-miler. the Chapman Aid Station lie between them. I took this photo last summer. Meanwhile, many of our ultra friends run, crew, pace, and/or volunteer at this race. Lots of 'em come out to Silverton for two or three weeks before the race to get acclimated and familiarize themselves with the course. 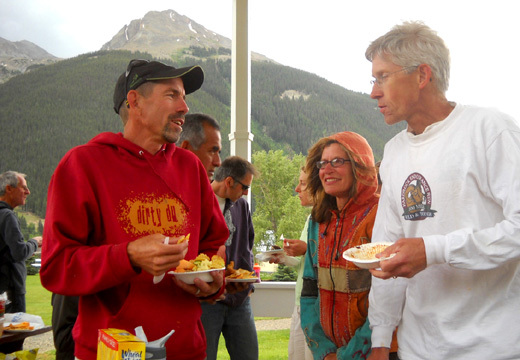 It's a great way for us to socialize with them during training runs, trail marking days, trail work days, organized events, and just hanging out in and around Silverton, the hub of race activities. 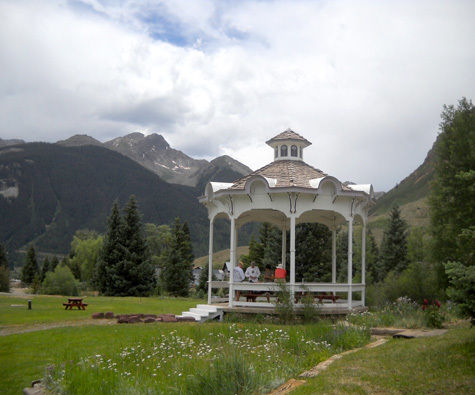 The people are as good a reason for us to spend several weeks in the Silverton area as the fabulous mountains we love to explore there. 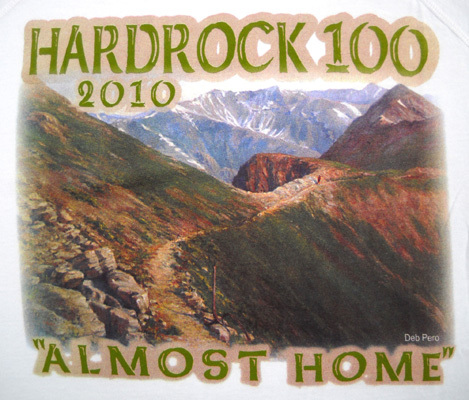 Runners have 48 hours in which to finish the difficult Hardrock course. The race starts at 6 AM on the second Friday in July and officially ends at 6 AM on Sunday. 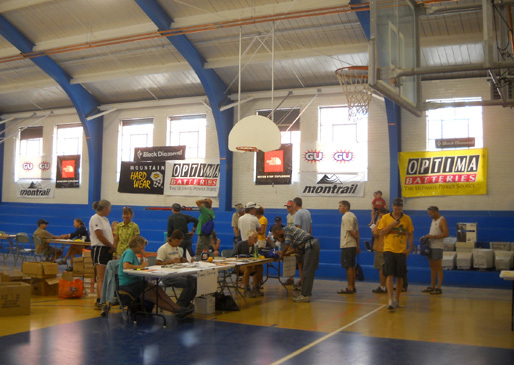 Runners check in at the Silverton HS gym early Wednesday afternoon. During check-in runners pick up their race numbers, receive their entrants' shirts and sponsors' goodies, and get their medical check and wrist band with their medical information on it. (standing, in gray shorts), Liz Bauer (in orange shirt), and other runners wait their turn. In less than an hour we got to see the runners and crew/pacers mentioned in these photo captions, as well as Jim Ballard, Matt Watts, Betsy Kalmeyer, Blake Wood, Rodger Wrublik, Jamil and Nick Coury, Charlie Thorn, Rickie Redland and John McManus, Rick Hodges, Roger Ackerman, George Velasco, Deb Pero, John Hallsten, Tom Schnitzius, Kris Kern, Dave Coblentz, Jennifer Roach, and a bunch of other friends and acquaintances from around the country. We knew just about everyone in the gym. We probably know a higher percentage of runners and their family members at Hardrock nowadays than at any other ultra running event -- and we've never even run the race! That's because we've volunteered here so often, the entrant number remains relatively low, and many of the runners are ultra veterans we've known for up to a decade and have seen all around the country. 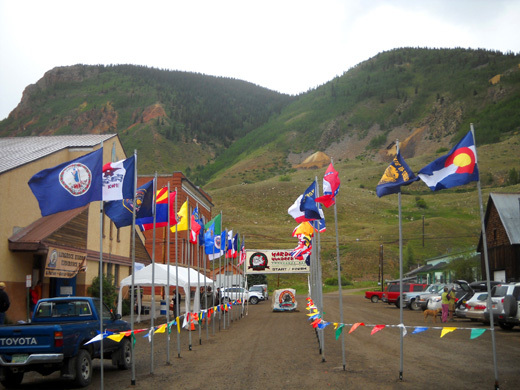 There are so many newcomers to the sport in recent years that we know fewer and fewer runners at other races that don't have Silverton's strict qualifying standards, even other 100-milers. Hardrock entrants have until 11 AM on Thursday, the day before the race begins, to check in; those who don't, forfeit their spot. I can guarantee you that those are coveted spots! Only about 140 runners may begin the race, a relatively small number by today's 100-miler standards. There is a complicated lottery system for entry and this year there were at least double the number of hopeful entrants on the wait list as those chosen in the drawing in early February. These days, the odds of getting into Hardrock (unless you've finished the race at least five times) are only slightly better than getting into Western States! 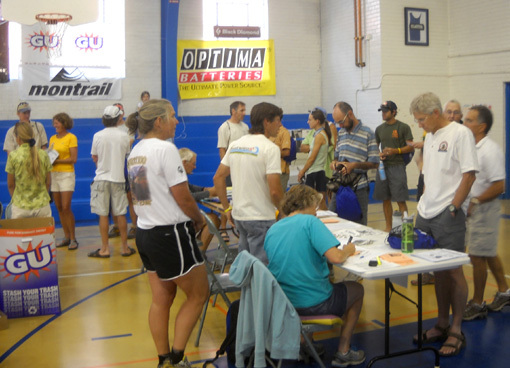 This side of table, L-R: Margaret and Mark Heaphy and Rebecca Clark check in runners. Far side of table, L-R: Mike Dobies, Pat Homelvig, Karen Pate. As you can imagine, a lot can happen in the five months between the lottery and the race; stuff (life) happens. Runners get injured, plans change for a myriad of reasons. When an accepted entrant officially withdraws from the event at any time prior to the race, everyone on the wait list moves up a spot. In recent years, runners who started out at #30 or even #40 or higher on the wait list in February could reasonably plan on moving up to a secure spot by race day. Not this year, however. For various reasons there were fewer pre-race drops and only about half the usual number of wait-listed runners got in. nice-quality HRH-embroidered apparel and race gear/supplies in the gym. This process can be very unnerving for folks who end up in the first 50 or so positions on the initial wait list and see only gradual movement until a few days or weeks before the race. They don't know whether to train full out for the event or not, whether to get time off from work, or whether to make travel and housing arrangements. Some runners take their names off the wait list because of the uncertainty -- ironically, another way in which other wait-listed runners move up the list. That's stressful, but it gets worse! In past years a bunch of runners have found out they can run Hardrock after that 11 AM deadline the day before the race (19 hours before race start, to be precise). They have to be present to hear their name drawn, let race officials know they want to run the race, then scurry to prepare themselves, their drop bags, and their crews/pacers on short notice. That could mean three nights of no sleep. Five of the 17 handsome posters that finishers have received at Hardrock. selects one for the posters and volunteer shirts. This year's design by Deb Pero is on the right. Worse yet, a few runners have gotten even less notice that they may run the race. If someone checks in on Wednesday or Thursday, but doesn't check in again with race officials within 15 minutes before the gun goes off on Friday morning, they forfeit the right to run the race -- and open up a spot for the first person(s) on the wait list! How's that for advance notice? 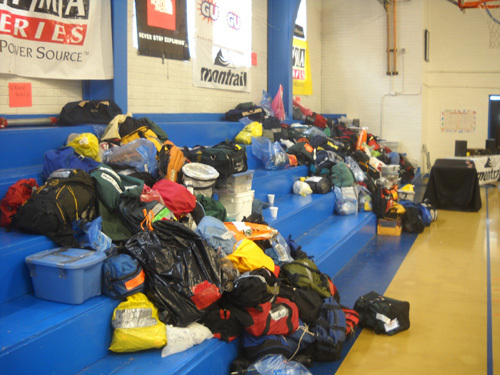 Usually the first two or three folks who are on the wait list Friday morning -- and are present in the gym -- have their gear and drop bags ready to go, just in case. Getting their heads wrapped around the uncertainty is another thing entirely! Can you imagine the stress?? If they don't get in, they usually volunteer, crew, and/or pace. I mean, they spent all this 1) time training and 2) money to get to Silverton, so they may as well stay and experience the race from another perspective. While I'm talking about the wait list I'd like to share a heart-warming story from this year's race. It involves two of our ultra-running buddies, who we first met at The Bear 100 in the early 2000s. This year's poster child for Most Determined Wait-Listed Runner has to be our friend Deb Pero, AKA "Granny Nanny" on her and her husband Steve's website (he's the "Old Goat" half of the "Perogoats"). Hardrock has been Deb's and Steve's favorite race for the past decade. They even got engaged on the course during the 2001 race. 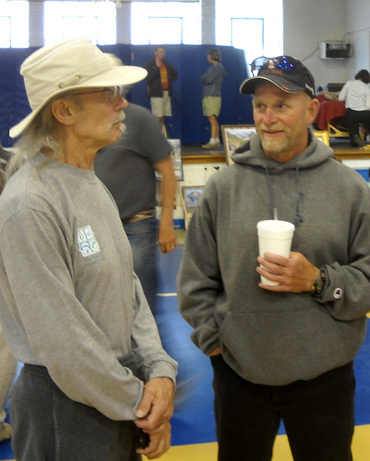 Deb and Steve (right) talk with John Beard at the HRH Pot Lick al fresco buffet on Wednesday. Each has finished the course at least once and they've usually gotten in, even when wait-listed in 40th place or below. Last year Deb got in but Steve was far enough down on the wait list that he had no hope of gaining entry. 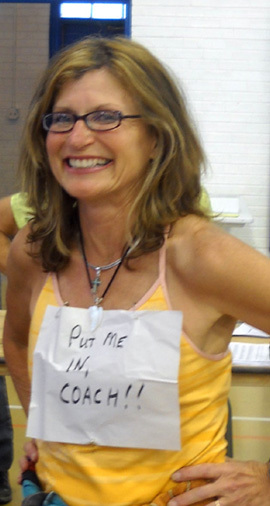 In the spring, when the couple decided to put their house up for sale in New Hampshire so they could return to New Mexico (to be closer to the Hardrock course and their beloved San Juan Mountains), Deb magnanimously withdrew from the race. Staying home and selling their house became a higher priority even though they both very badly wanted to be part of the 2009 Hardrock event. Fast-forward to early 2010. After missing a year at Hardrock, you can imagine how much the couple wanted to get into the race! Steve lucked out this time and got in through the lottery in February but Deb was #28 on the wait list -- almost the reverse of last year, only Deb was relatively high on the list this year. Based on previous race history, Deb knew she'd most likely get in so she trained accordingly (i.e., diligently). You can read Steve's blog entry in February, 2010 to get the whole story. Despite some attrition of runners throughout the spring and summer, however, Deb found herself "only" #1 on the wait list on race morning. Unless one more runner dropped out, she'd be crewing and pacing Steve instead of running the race herself. During the mandatory runner briefing on Thursday, she even offered to give her valuable original oil painting of the course -- the artwork chosen this year by race management for the finishers' poster, back of the volunteer shirt, and for promotional materials related to the event -- to any runner who gave up their spot to let her in! 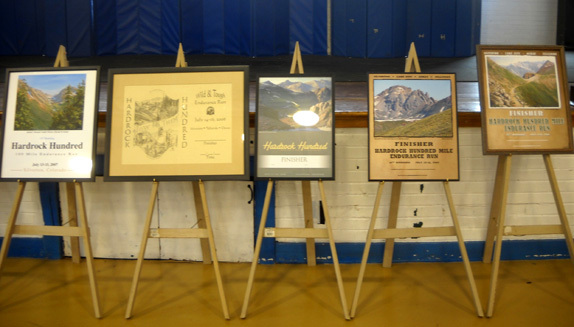 paintings has been chosen for these shirts, the finishers' posters, and promotional race materials. It was obvious how badly she wanted to run the race. Unfortunately, no one "bit" and she was still #1 on the wait list after the 11 AM deadline to check in on Thursday morning. She had only one more, fairly remote, chance of running the race. She probably spent the night with her fingers crossed that someone would have a change of heart on Friday morning and withdraw from the race. THE OLD GOAT: WHAT A GUY! Then something happened that has to be one of this year's best moments in ultra running: her husband hatched a plan that he kept secret from Deb until almost the last minute. Since he already had two finishes in the clockwise direction (the loop course changes direction each year) -- and because Deb was concerned that her chances of finishing Hardrock were diminishing each year in her mid-50s -- Steve told race officials that he would relinquish his spot in the race to Deb if no one withdrew by the second and final deadline to check in 15 minutes before the race. Let me repeat that: 15 short minutes before the start of one of the most grueling 100-milers in the world. Long story short . . . everyone checked in by 5:45 AM, Steve officially withdrew, Deb (who was probably in shock at first) refused to let him do it until Steve made it clear that #2 on the list would get his spot if she didn't take it, Deb agreed to run, just about everybody who heard the story teared up in amazement and joy, and Deb started the race with less than 15 minutes' warning!! You can read Steve's synopsis of the event in their blog. Deb and Steve leave the Grouse Gulch AS on Saturday morning. Deb had already gone 58+ miles. I think Steve deserves an award for Most Generous Ultra Running Husband of the Year! That was truly a sacrifice borne of love. Or maybe it was karmic payback for last year when Deb sacrificed her spot in the race to accomplish a longer-term goal they had -- selling their house and moving to New Mexico. She gets my award in retrospect for Most Generous Ultra Running Wife of 2009! There are some lessons here re: successful keys to marital happiness. Deb and Steve are a couple committed to each other, to their long-term goals, and to effective teamwork in everything they do. The bar has been raised for married couples everywhere. 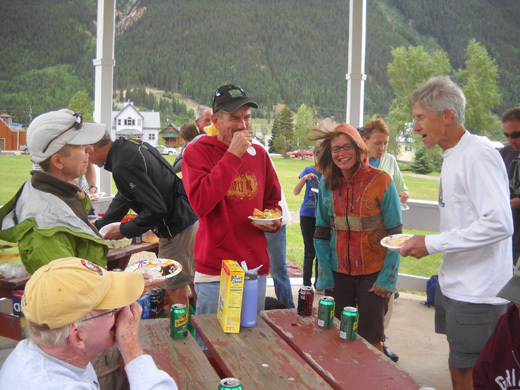 Two days prior to the race each year, ultra runner and HRH committee member Andrea Feucht organizes the Pot Lick, a typical pot-luck style lunch served in the breezy gazebo at Silverton's pretty little city park. 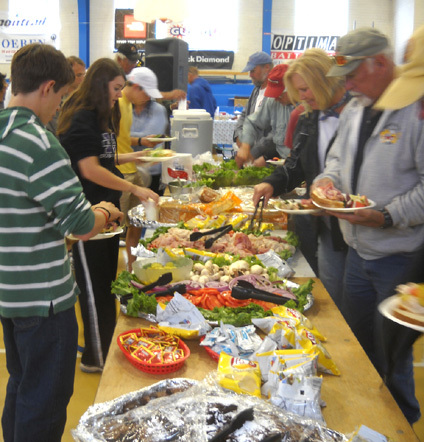 What maybe isn't so typical is the mostly-healthy food the participating runners bring to the table. It's a chilly, cloudy day for a picnic, but we didn't get rained out. Jim and I always like to take part in the Pot Lick when we're in Silverton for the race. I think I've always taken melon balls served in scooped-out watermelon halves because the dessert is light, tasty, colorful, healthy, and relatively easy to prepare in the camper. (I include watermelon, cantaloupe, blueberries, and either green grapes or honeydew.) Other runners bring items ranging from vegan salads to pizza to ice cream. There's always something for everyone. The best part, however, is socializing with old and new friends. We were two of the first to arrive on Wednesday afternoon after we had visited with pals in the gym at check-in. Race entrants and their friends/families arrived in the park gradually from 1-4 PM after picking up their numbers and getting their medical checks, eliciting interest from the pot-lickers already present when each new dish was set on the heavily-laden table. Ooo, look! They brought some yummy home-made fudge brownies! Let's get one! Who says ultra runners always eat healthy foods? They can justify it as fuel for their upcoming race. 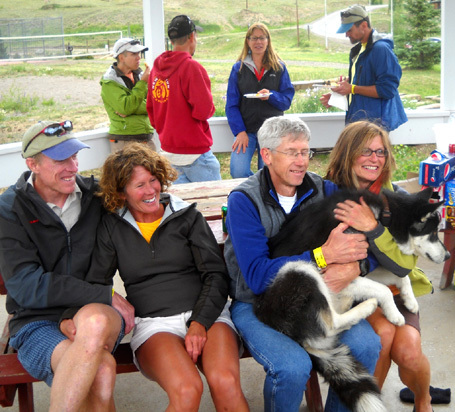 Deb and Steve were smart -- they borrowed a warm, furry husky from another runner!! When we went back by the gym later in the afternoon I purchased a warm, furry fleece jacket with an embroidered HRH emblem (my excuse was to have something warmer during our volunteer stint at Grouse Gulch on Friday night). Only a few flags were in place about 1 PM on Wednesday. This is a colorful tradition that Rodger began at Nardini Manor in the Phoenix area for the popular Across the Years (ATY) 72-, 48-, and 24-hour runs at New Year's Eve. Runners enjoyed seeing their state or national flags flying around the track so much, he decided to do something similar at Hardrock. Two or three hours later, quite a bit of progress had been made. Various pre-race activities continued on Thursday morning, including runner check-in #2 and the mandatory runner briefing. We didn't attend those this time. Jim did a 13-mile run up to Clear Lake and back to the camper, while Cody and I walked and ran (to literally try to outrun a storm) on South Mineral Creek Road. It felt good to run but I still got sleeted on. Neither Jim nor I are completely acclimated to these lofty elevations yet. We knew we wouldn't have much opportunity to run or hike during race weekend so we went all out today. We did attend the volunteer lunch and briefing in the afternoon because we're volunteering here for the fifth year. Free food and good company -- who can resist?? 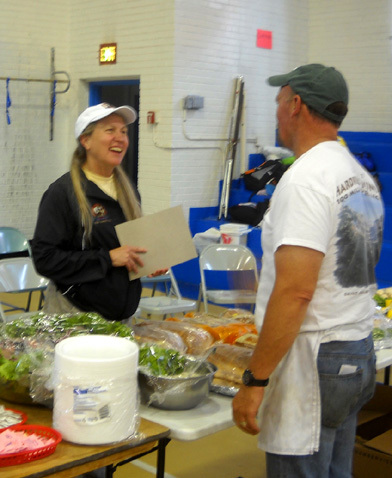 Volunteer coordinator Lois McKenzie talks with the fella catering our lunch. Although I love to work check-in at races, I haven't been able to crack into the small group that always helps with check-in at Hardrock. That's OK. There's always been plenty of other ways in which we can volunteer, including gathering and organizing supplies for the aid stations, captaining or working at an aid station, helping Heidi with the race merchandise, and doing communications/timing jobs. This year we chose to work with the communications team again. Roy and Laura always work the first aid station during the race, sending runners' times in and out of the AS to headquarters so the live website can be updated in a timely manner and runners will have accurate splits after the race. Last year, in the CCW direction, they worked at Cunningham. That's where Jim and I were doling out water as the runners came through in a two-hour span of time. 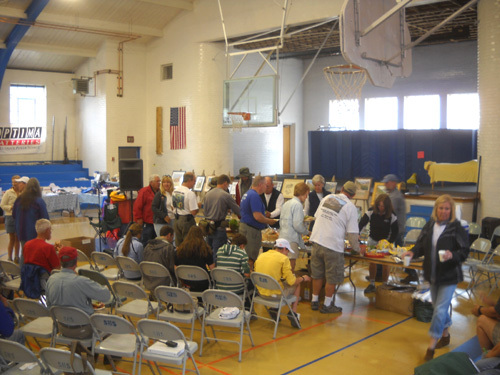 Roy (in gray jacket) and Laura are to the right in the lunch line. When the aid station closed down at mid-morning on Friday last year, we were done with that job. 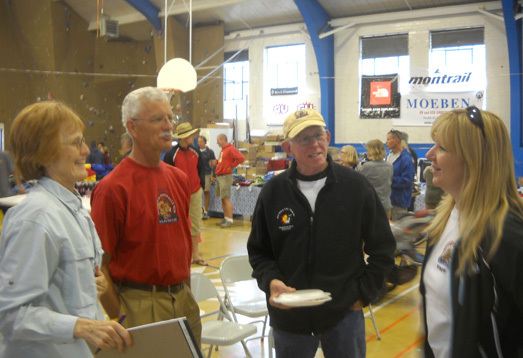 The rest of the race Jim volunteered several hours of his time at HQ to learn the ropes from Roy, Laura, and other volunteer ham operators who were receiving information at the gym. The hams who were at the aid stations either called in runners' times in/out of each aid station or sent times via computerized "packets." You can see the 2010 runner splits here. After that experience, we decided we were ready for a change from working aid stations during Hardrock and Leadville and would like to do communications/timing jobs for a while. L-R: Jigger, Paul, Jim, and Shauna discuss this year's communications assignments. 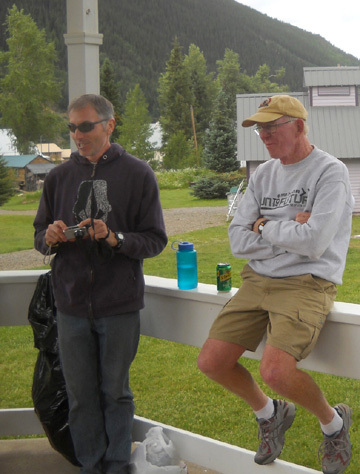 This year Jim and I were assigned to work at the Grouse Gulch aid station with another experienced ham radio couple that has worked the HRH race for several years: Jigger and Paul, who we have already met at the 4th of July parade. We talked with them and with Shauna Blaylock, communications volunteer coordinator, before and after the volunteer meeting to learn more about our responsibilities and the hours that we'd be working. Even though two other couples are coming to help Jigger get the runners' times as they enter and leave the aid station, Jim and I will probably stay the entire time the aid station is open (mid-afternoon on Friday until mid-afternoon on Saturday) to help Paul transmit the runner data. 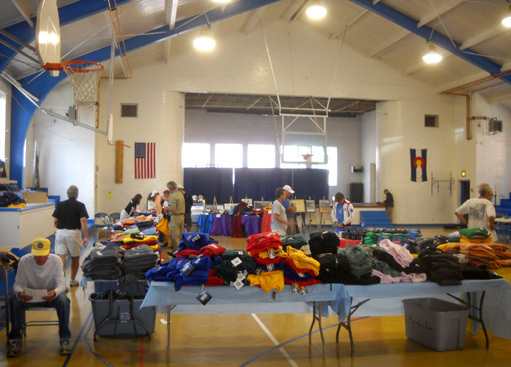 As aid station co-directors at Cunningham in 2006 and 2007, we were responsible for getting the runners' bags to and from our aid station -- to say nothing of tents, tables, chairs, stoves, cooking equipment, large containers for water and electrolytes, food, etc. 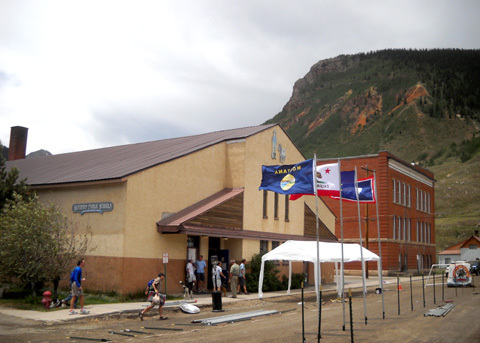 Even with "only" 140 runners in Hardrock, it's a large task to organize, set up, maintain, and shut down an aid station, plus manage the volunteers. We were glad we didn't have that much responsibility this year! During the briefing we were given our handsome synthetic short-sleeved volunteer shirts. I like them even better than the previous cotton t-shirts we've gotten at HRH because these are good for running, hiking, cycling, etc. They are white and have raglan sleeves, which is also different. After the briefing we talked with some of the runners who came back to socialize and browse through Heidi Schutt's great selection of Hardrock clothing and gear. Then we headed home to fix supper and begin gathering all the things we'd need for ourselves and Cody at Grouse Gulch during the race. We knew we'd need a good night's sleep Thursday because we wouldn't be getting any or much sleep Friday night.